Our intermediate school students are challenged each day by dynamic teachers who focus on meeting their academic and social needs. St. Patrick School’s intermediate teachers regularly collaborate to provide the most empowering educational experience possible in the third, fourth and fifth grades. The teachers are committed to providing every student a strong academic foundation, while also developing each child’s unique potential. Our curriculum is centered on the latest standards and research, while we maintain a constant focus on our faith, commitment to service, and living out the values of our Church. 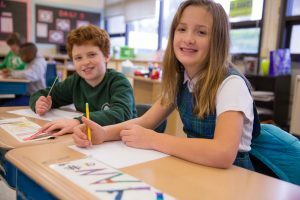 The curriculum is designed to meet Common Core Standards developed by the State of Washington and also Archdiocesan guidelines. Specialists round out a well-balanced offering for our intermediate children. We support the social development of each student in preparation for middle school and beyond. Students leave our care ready to participate, collaborate, and lead our student body as confident and competent middle school students.